This application is a continuation 09/014,789 filed Jan. 28, 1998 of U.S. Pat. No. 6,165,166, which claims priority to Provisional Application Ser. No. 60/044,879, filed Apr. 25, 1977. In another aspect, there is also provided a medical device suitable for percutaneous transluminal use comprising the tubing of the present invention and a radially expansive component operationally coupled to the tubing. For example, the tubing of the present invention may be utilized to define the guidewire lumen of a balloon catheter. More specifically, the trilayer tubing of the present invention may define the guidewire lumen of an over-the-wire catheter, i.e., where the guidewire lumen as defined by the trilayered tubing runs the entire length of the catheter. The tubing of the present invention may also define the guidewire lumen of a rapid exchange catheter, i.e., wherein one end of the guidewire lumen as defined by the tubing of the present invention extends through the distal end of the catheter and the opposite end exits through an outer wall of the catheter. Additionally, the trilayered tubing of the present invention may be utilized to form the inner member of a stent-delivery device, wherein a stent is releasably mounted to the tubing of the present invention. As used herein, the phrase “direct bond” (or “directly bondable”) is meant to indicate a bond between two materials that requires no bonding substance, i.e, adhesive, interposed between the materials (or materials that are so bondable). Additionally, the term “lubricious” as applied to the materials herein is meant to indicate a material that has a kinetic coefficient of friction (steel on polymer) of less than about 0.5. As used herein, “elastomeric” is meant to indicate that property of a material that allows the material to be stretched to at least twice their original length and to recover its original shape partially or completely after the deforming force has been removed. “Glass transition temperature” or “Tg” as used herein and as is generally known to those of skill in the art, refers to that temperature at which an amorphous material changes from a brittle vitreous state to a plastic state and may be determined by Differential Scanning Calorimetry (DSC). Finally, as used herein, the phrase “acid-functional” is meant to indicate materials that have pendant acidic functional groups. Outer layer 16 may preferably comprise a polyester, a polyamide or combinations thereof Exemplary polyesters which are suitable for use in outer layer 16 include polyesters containing both polyether and polyester segments. Particularly suitable are the family of polyether polyesters commercially available under the trade name Hytrel® from E.I. DuPont De Nemours and Company, Wilmington, Del. Also well-suited for use in outer layer 16 of tubing 10 of the present invention are the family of polyesters available under the trade name Arnitel® from DSM Engineering Plastics, Evansville, Ind. As representative examples, the at least one lubricious polymeric material incorporated into core layer 12 may preferably be selected from an olefinic polymer, a fluorinated polymer, or combinations thereof More preferably, the material of core layer 12, if an olefinic polymer, may comprise a high density polyethylene, an ultra high density polyethylene, a low density polyethylene, a linear low density polyethylene, or combinations thereof Such polyethylene resins are commercially available from the Quantum Chemical Company, Cincinnati, Ohio, under the trade name Petrothene® LS 5060-00 and LM 6007-00. Additional materials that are believed to be suitable in core layer 12 include fluorinated polymers such as polytetrafluorethylene (PTFE) and polyvinylidenefluoride (PVDF). Because PVDF is much easier and practical to extrude than PTFE, PVDF is presently a more preferred fluoropolymer. Intermediate tie layer 14 is interposed between outer layer 16 and core layer 12. preferably in a manner such that neither the inner or outer surface of intermediate tie layer 14 is exposed. Intermediate tie layer 14 is preferably made of a polymeric material comprising functionality capable of adhering outer layer 16 to core layer 12. In this manner, intermediate tie layer 14 aggressively links the two other layers together with a strong connection that resists delamination. Generally, preferred polymers for use in intermediate tie layer 14 have a weight average molecular weight in the range of from about 40,000 to about 250,000.
or combinations thereof, and the like. 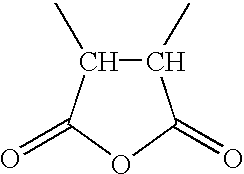 Other examples of acid and anhydride functional polymers that are believed to be suitable for use in intermediate tie layer 14 include acid functional ethyl vinyl acetate resins, acid functional ethylene acrylate polymers, anhydride functional ethylene acrylate copolymers, anhydride functional ethyl vinyl acetate copolymers, acid and acrylate functional ethyl vinyl acetate resins, anhydride functional ethyl vinyl acetate copolymers, and anhydride functional ethyl vinyl acetate resins. In particular, suitable acid and anhydride functional polymers are commercially available under the trade name of Bynel® from E.I. DuPont De Nemours, Wilmington Del. The thicknesses of layers 12, 14 and 16 will vary depending upon desired applications. For example, when used to define the guidewire lumen of an angioplasty catheter, the core layer 12 of tubing 10 will preferably have a thickness of from about 0.01 to about 0.05, while the intermediate tie layer 14 is preferably of a thickness of from about 0.006 to about 0.03 and outer layer 16 is preferably from about 0.01 to about 0.05 thick. More preferably, core layer 12 will be from about 0.01 to about 0.04 thick, intermediate tie layer 14 will be from about 0.003 to about 0.03 and outer layer 16 will be from about 0.01 mm to about 0.04. Additionally, the diameter of tubing 10 will vary depending upon the end-use application. Typically, the overall, or outside, diameter (Do) is typically between 0.5 and 0.7, and will preferably be from about 0.55 to about 0.63 mm. Core layer 12 will preferably define a lumen, such as a lumen adapted to receive a guidewire. The inside diameter (Di) of the lumen so formed is typically from about 0.4 mm to about 0.6, and will preferably be from about 0.43 to about 0.51. Thus, it is preferred that outer catheter tubing 222 is directly bonded to balloon 224 at distal end 226. These direct bonds may be established by any method known to those of ordinary skill in the art that effectively forms fluid tight seals between the materials to be bonded. For example, the direct bonds may be established by conductive, convective, or radiative heating, combinations thereof, of any one of these heating methods used in combination with pressure applied to the bond area. Furthermore, the direct bonds may be formed by fusion bonding. Fusion bonding using laser energy is disclosed in U.S. Pat. Nos. 5,267,959 and 5,501,759; the disclosures of which are incorporated by reference herein. Catheter 420 comprises a tubular proximal shaft 460, a tubular stem 462, inner catheter tubing 410 and a balloon 424. Stem 462 is in fluid communication with proximal shaft 460 and is bonded to the distal end 492 of proximal shaft 460. Inner catheter tubing 410 defines guidewire lumen 434. Inner catheter tubing 410 extends from distal portion 492 of proximal shaft 460 and through lumen 464 of stem 462, beyond the distal end 494 of stem 462, and through balloon 424. Inner catheter tubing 410 additionally comprises a proximal end 496 open to the outside of the catheter 420 at skive 466. Inner catheter tubing 410 and stem 462 are preferably directly bonded together at weld 4102 proximal to balloon 424. At the skive 466, the distal end 492 of proximal shaft 460, the proximal end 496 of tubular stem 462, and the proximal end 4100 of inner catheter tubing 410 are directly bonded together. Inner catheter tubing 410 is off-center at skive 466 but becomes approximately centered throughout the remaining length of stem 462. Balloon 424 is arranged coaxially around inner catheter tubing 410 with the proximal neck 4104 of balloon 424 directly bonded to the distal end of stem 462 at the outer surface thereof The distal neck 432 of balloon 424 is directly bonded to the distal end 4106 of inner catheter tubing 410, together forming the catheter tip 468. 1 Laser gauge Zumbach (to check dimensions). The following experiment was performed to investigate the effects of irradiation sterilization on an HDPE layer of trilayer tubing. Specifically, one hundred pieces of 6″ tubing made of Hytrel® 63D as the outside layer, Plexar® 209 as the middle layer, and HDPE 6007 as the inside layer were irradiated (0.0185″ overall ID×0.0265″ overall OD). Twenty pieces were irradiated at dosages of 20 Mrad, 30 Mrad, 40 Mrad, 50 Mrad, and 60 Mrad, respectively. Control samples receiving no irradiation were also provided. “Resistance felt” means the point when the tube collapsed enough so that an increase in friction was felt on a guidewire by an operator pulling it through the tubing. “Locks up” is meant to indicate the point at which the guidewire is completely stuck due to the collapse of the tube. “Resistance felt” and “lock-up” have the same meanings as in Example 3. Tests were performed to determine the tensile strength effect of annealing at different temperatures and times for 0.0185″ ID×0.0235″ OD trilayer tubing. Material composition of the tubing is Hytrel® 7246 as the outside layer, Plexar® 209 as the middle layer, and HDPE 6007 as the inside layer. Five unannealed tubes of the same size were tested and found to have an average peak load of 1.255 lbs (standard deviation 0.047). A test was performed on 10 pieces measuring 0.0185″ ID×0.0235″ OD to check for shrinkage. The pieces were made of Hytrel® 7246 as the outside layer, Plexar® 209 as the middle layer, and HDPE 6007 as the inside layer. Parts were measured for i.d. with a mandrel, o.d. in two marked places, and length. They were annealed for 4 hours at 120° C. and found to have no significant shrinkage in any parameter measured. wherein the glass transition temperatures for the first polymeric material, the second polymeric material, and the intermediate layer are within 85% to 115% of one another. 2. The co-extrusion of claim 1, wherein the co-extrusion is tubular in shape. 3. The co-extrusion of claim 2, wherein the first polymeric material defines a lumen of the tubular co-extrusion. 4. The co-extrusion of claim 1, wherein the second polymeric material is selected from a polyester, a polyamide, or combinations thereof. 5. The co-extrusion of claim 1, wherein the second polymer is a polyester. 6. The co-extrusion of claim 5, wherein the polyester comprises at least one polyether segment and at least one polyester segment. 7. The co-extrusion of claim 1, wherein the second polymer is a polyamide. 8. The co-extrusion of claim 1, wherein the first polymeric material is selected from an olefinic polymer, a fluorinated polymer or combinations thereof. 9. The co-extrusion of claim 8, wherein the olefinic polymer is selected from high density polyethylene, ultra high density polyethylene, low density polyethylene, linear low density polyethylene, or combinations thereof. 10. The co-extrusion of claim 8, wherein the fluorinated polymer is polyvinylidene fluoride. 11. The co-extrusion of claim 1, wherein the intermediate tie layer comprises a polymer selected from an anhydride modified olefinic polymer, an acrylate modified olefinic polymer, or combinations thereof. 12. The co-extrusion of claim 11, wherein the polymer of the intermediate tie layer is selected from a functionalized polyethylene, a functionalized vinylic polymer, a ethylene-methyl acrylate copolymer, an acid modified ethyl vinyl acetate polymer, an acid modified ethylene acrylate copolymer, an anhydride modified ethylene acrylate copolymer, an anhydride modified ethyl vinyl acetate copolymer, an acid modified ethyl vinyl acetate polymer, an acrylate modified ethyl vinyl acetate polymer, an anhydride modified ethyl vinyl acetate copolymer, an anhydride modified ethyl vinyl acetate polymer, or combinations thereof. 13. The co-extrusion of claim 12, wherein the polymer of the intermediate tie layer is selected from a functionalized polyethylene, a functionalized copolymer obtained from monomers comprising ethylene and alley (meth)acrylate, an anhydride modified ethyl vinyl acetate polymer, or combinations thereof. wherein the first, the second and the third glass transition temperatures are within 85% to 115% of the glass transition of the layer or layers adjacent thereto. 15. The catheter shaft of claim 14, wherein the outer layer lacks a bonding affinity to the core layer. 16. The catheter shaft of claim 14, wherein the intermediate tie layer possesses a bonding affinity to both the outer layer and the core layer. 17. The catheter shaft of claim 14, wherein the catheter shaft further comprises a radially expansive component coupled to the catheter shaft. 18. The catheter shaft of claim 17, wherein the radially expansive component is a balloon. 19. The catheter shaft of claim 14, wherein the outer layer is selected from a polyester, a polyamide, or combinations thereof. 20. The catheter shaft of claim 14, wherein the core layer is selected from an olefinic polymer, a fluorinated polymer or combinations thereof. a balloon having a proximal end, a distal end and an expandable region there between, wherein the distal end of the balloon is affixed to the distal segment of the second tubular member and the proximal end of the balloon is affixed to the first tubular member, and further wherein the expandable region of the balloon is in fluid communication with the lumen of the first tubular member. 22. The balloon catheter of claim 21, wherein the outer layer is selected from a polyester, a polyamide, or combinations thereof. 23. The balloon catheter of claim 22, wherein the core layer is selected from an olefinic polymer, a fluorinated polymer or combinations thereof.